Isabel Flens handles the ball. The senior midfielder and the rest of the Wildcats’ offense was quiet over the weekend in losses to Indiana and No. 8 Louisville. 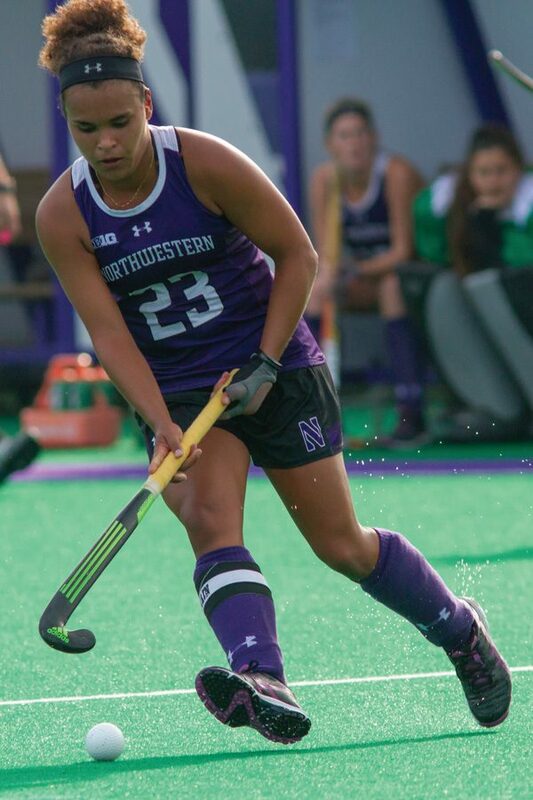 Northwestern ended one streak Friday and began a streak of another kind Sunday. The No. 6 Wildcats (10-4, 4-1 Big Ten), who entered the weekend on an eight-game winning streak and hadn’t lost in four weeks, fell at unranked Indiana (7-7, 2-2) 2-1 on Friday, then slipped again in a 2-0 road loss to No. 8 Louisville (11-3) on Sunday. Because of Friday’s loss, NU’s grip on the top spot in the Big Ten standings is now less secure. The Cats are tied with No. 5 Penn State and No. 7 Maryland for the conference lead, though NU holds head-to-head tiebreakers against both teams. In both losses, the Cats’ offense was far less surgical than in recent games. NU generated many opportunities against the Hoosiers, earning eight penalty corners and forcing 11 saves, but scored only on freshman midfielder Lily Katzman’s shot midway through the first half. On Sunday, the Cats were virtually shut down. NU tallied only four shots, just two of which were on frame, and earned a paltry three corners. The Cats were shut out for the first time since early in the 2014 season. Both offensive performances were in stark contrast to recent outputs. NU has been extremely efficient as of late, scoring seven goals despite earning just six penalty corners against Drexel last weekend and notching five goals on six shots on frame at Rutgers. Beyond the offensive struggles, the loss to Indiana was the team’s first slip in a game in which it was the clear favorite. NU entered the weekend undefeated against unranked teams and won those seven games by an average of more than four goals. The weekend also marked the first time this season the Cats lost consecutive games. Following each of its first two losses of the year, NU responded with decisive wins, albeit against lesser competition. The 0-2 weekend was the Cats’ first since 2011. Nonetheless, NU played a pair of contested, evenly-matched games and were far from overrun, junior back Sophia Miller said. The Cats remained upbeat about their weekend. Neither Fuchs nor her players expressed concern about the team’s play and stressed the importance of upcoming Big Ten home games against No. 16 Iowa and No. 10 Michigan.